The above 8.5cmx5.75cm black & white photo comes from the collection of the late Pam Gartung (nee Corrigan),a longtime Berowra resident. The fire tower shown was located out at what is now the Barnetts Road Reserve and Barnetts Look out. It was erected in the early 1960’s and used until about the end of the1980’s to watch for developing fires and report them. Other fire towers used in those years were built at Cowan and Canoelands Now, our area has the Berowra Heights and Galston Fire lookout Towers. The figure on the ladder draws the eye of the viewer. He seems to be wearing only swimmers, sunglasses, a shoulder bag & shoes! Must have been a hot summer’s day! 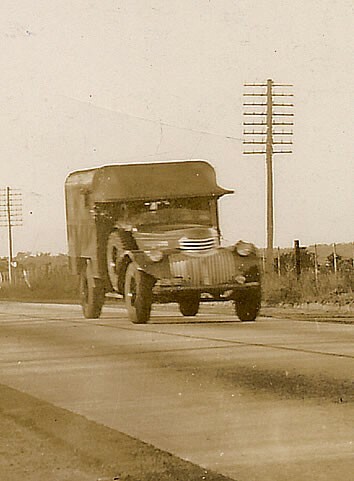 Ex-Army Ambulance, the Brigade’s first vehicle seen on the Pacific Highway, Berowra. 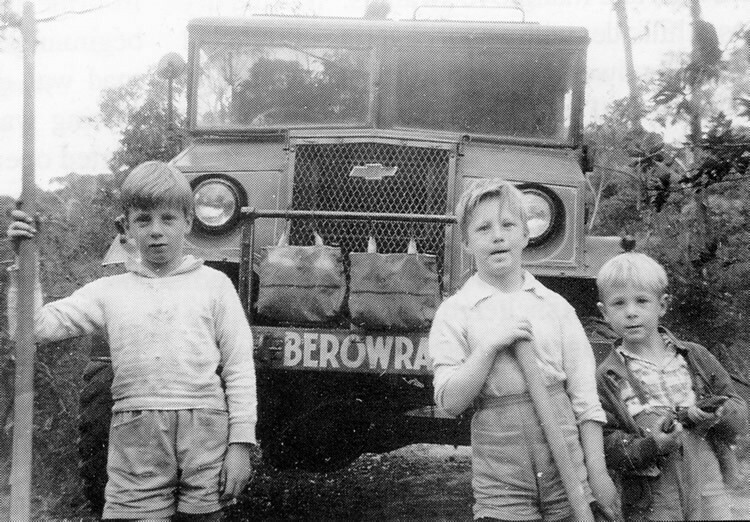 Summer in Berowra can bring family gatherings for celebrations and for responding to bushfires! Back in 1940 a request was made for a fire hydrant, reel and hose with a view to forming a Berowra volunteer Fire Brigade. 1943 saw the first officers elected and the birth of our Bush Fire Brigade. During the war years petrol was rationed and the volunteers used their own vehicles. 8 Shovels, 15 Rakes, 6 Knapsacks, 8 Axes, 2 Canvas waterbags, 6 Hurricane lights (kerosene), 8 Brush hooks & 2 Garden hoses. Hatfield boys with Betsy an ex-Military Fire Tanker used from 1949-1972. Top speed down hill about 40mph. Over the years equipment has certainly improved and increased! We want to say thank to the men and women of what is now the Berowra Rural Fire Service and the Berowra Waters Rural Fire Service for their commitment to our community and beyond. Thank you for 70 years of service!